Bouncer Boot Out, the debut iPhone app from Australian developer 5th World Media, puts players in the role of the jerk bouncer at the most exclusive clubs. Using your finger, it is your job to flick unwanted patrons out of the queue, unceremoniously kicking them to the curb. You also have the power to shift the position of the people in the queue to gather the most desirable of potential club-goers together, arranging it so that a steady stream of customers are allowed in while rejects are grouped together and then flicked out for combo bonuses. On it’s release, Bouncer Boot Out will feature two modes of play: Timed/Story Mode and Survival Mode. In Timed Mode, you must complete a series of shifts, accumulating a minimum target score in order to unlock new clubs, new characters and new challenges. 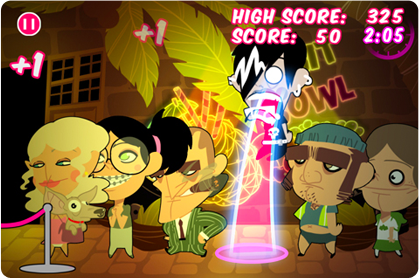 In Survival Mode, you attempt to achieve the highest score possible, before losing all lives. Content unlocked in Timed Mode can also be accessed in Survival Mode, meaning players will have a choice of different locations and varying degrees of difficulty. Bouncer Boot Out will be integrated with OpenFeint for leaderboards, achievements and challenges. The game is scheduled to be released on November 12 for a price of 99¢. Beyond that, several updates are already planned including an iPad release with multiplayer gameplay and new locations featuring new characters and new challenges (such as random weather effects).